The Converse Blog: The Converse Blog's Weapon Wednesday, Weapresent your Roots and a crazy Weapon idea. The Converse Blog's Weapon Wednesday, Weapresent your Roots and a crazy Weapon idea. As you've probably seen or heard Converse is bringing back the Weapon in 2009. It's set to be a big year for the Weapon, with new colorways and even a place at ConverseOne.com so you can customize your own Weapon. I hadn't shown any pics of the new Weapon yet, but I thought I'd bust out the most classic pair for a view today. I even saw a few websites, like Dazed Digital, that this new group of Weapons will be joined with a new tag line, Weapresent your Roots. I can only hope that there will be new Weapresent shirts for sale to match the shoes. All of this talk about the Weapon got me thinking the other day, which is dangerous. Anyway, I was thinking that an updated Weapon would make a pretty nice performance shoe. Some basic Weapon details have been used before in the Converse Legend and more recently in the Converse Loaded Weapon. 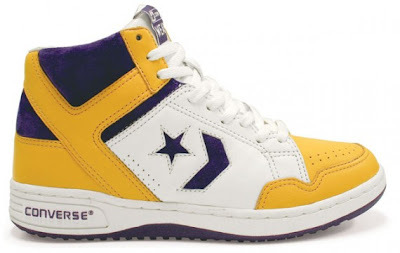 A shoe that came out the same year Converse signed Dwyane Wade, Chris Bosh, Kirk Hinrich, and others. However in recent years we've seen Adidas produce a updated Pro-Model every season and of course there was the Nike Air Force 25 from a few years ago, which should remind everyone that sometimes less is more. While it wouldn't be a completely original idea, I think it would be interesting to see how strong a reaction you would receive from an updated Weapon. Back in 1996 when the Converse All Star 2000 released, there was a tremendous response. People knew and trusted the Chuck Taylor All Star name and ankle patch, now I think people, (coaches) have the same respect for the Weapon. They grew up watching Magic, Bird and many other NBA players and college teams rocking the Weapon. It would also be a good opportunity to introduce a new technology or continue using the Converse Suspend Technology in the new Wade 4. It would also be a good opportunity to get Magic Johnson and Larry Bird back in the fold. I can see the commercial now, you get Larry to drive up to Magic's house with a group of NBA players and they could join some NBA players with Magic for quick pick up game. Oh well, just a crazy idea I wanted to share with everyone, either way look for the Weapon 86 coming in 2009. Hopefully I'll have some more pictures soon. Thanks for stopping and checking out the blog. Here is the problem I'm seeing with Converse. First the Dwade 4 is a straight bust if Converse is trying to make him the Michael Jordon of the company they are doing a piss poor job at it. Second the Weapon should be on the shelf every summer like Air Force Ones. Third market your other players you have like Brand or Kyle more with print,internet or tv. Fourth start having brands that people can attach to like Air Max etc. Fifth new shoe tech that stay with the brand...reuse some of the old stuff...what old can be new again. Sixth better designs some of these designs don't catch people's eye or buyers from such stores as Foot Locker etc.